Farewell, 2016. You’ve certainly been a year. Well, here goes 2016, a very hard year for many, many people. It’s been a tough one for us, too. We’ve had so many big transitions in the last year and it feels like it’s just been one thing after another. There are many reasons that I just want to say a big Eff you and good riddance to this year. But I’ve managed to stay positive. Our little Lollypop was born this year. Although he had a rough start, he’s a healthy, funny, chunky 20lb 8-month old, now and he’s crawling, cruising and babbling all over the place. He loves his big brother to pieces and most of the time, Jellybean loves him, too. I started a full time job. This has not been without its drawbacks, but on the whole, it’s been a positive for me and my family. I get to interact with people outside of my family (which is a relief to my husband, I’m sure) and making money is always nice. I did manage to get quite a bit of knitting done this year. With the layout of our new house, it’s been easier to knit a few stitches or a few rows in between chasing the baby around and keeping the big kiddo out of trouble. I actually managed to finish more this year than last year, even with the new baby and new job. According to my Ravelry list, (if I have them all tagged correctly) I started 28 projects in 2016 and finished 29 projects. I finished a few in the year that I had started in previous years. 7 of those were Christmas gifts. And now that I’m writing this post, I realize that there’s one Christmas gift project that isn’t even listed (because my mom’s on Ravelry, too. :D) I actually got all my Christmas knitting done a few days before Christmas and was able to get a head start on next year’s knitting. 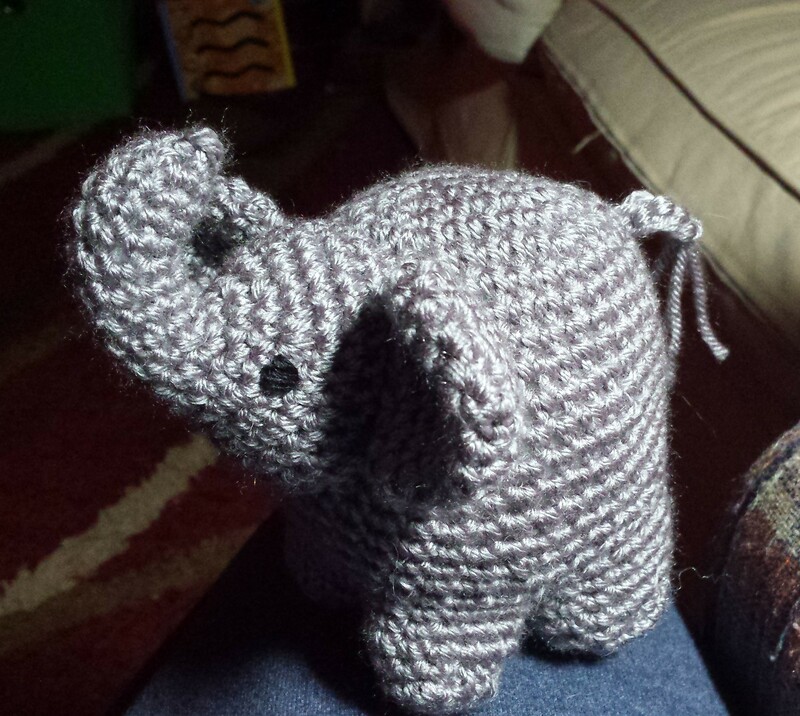 This was the year of knitted and crocheted toys for Christmas. Many of these I started back in February, but I got to the stuffing point and they sat until December. Haha. I made one of these for my brother, but I didn’t get a picture of it! It turned out very huge, but so cute. I did get pictures of most of them, like this Sunshine plushie for my eldest Niece. This Capybara plushie for my youngest Niece. 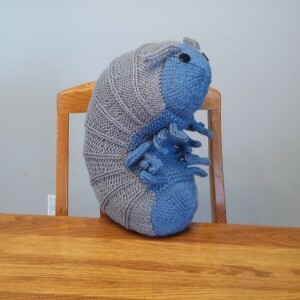 And this Pillbug plushie for my Nephew. 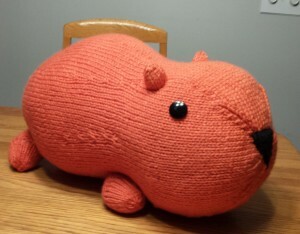 Of all of those, I think the Capybara is my favorite. Capybaras are very large rodents native to South America who are relatives to Guinea Pigs. I love Guinea Pigs and I had one named Alfred when I was in High school. Anyway, that was much fun to make and turned out about twice the size I expected it to! My own little ones got handmade toys, too. Lollypop got this cute little amigurumi elephant. 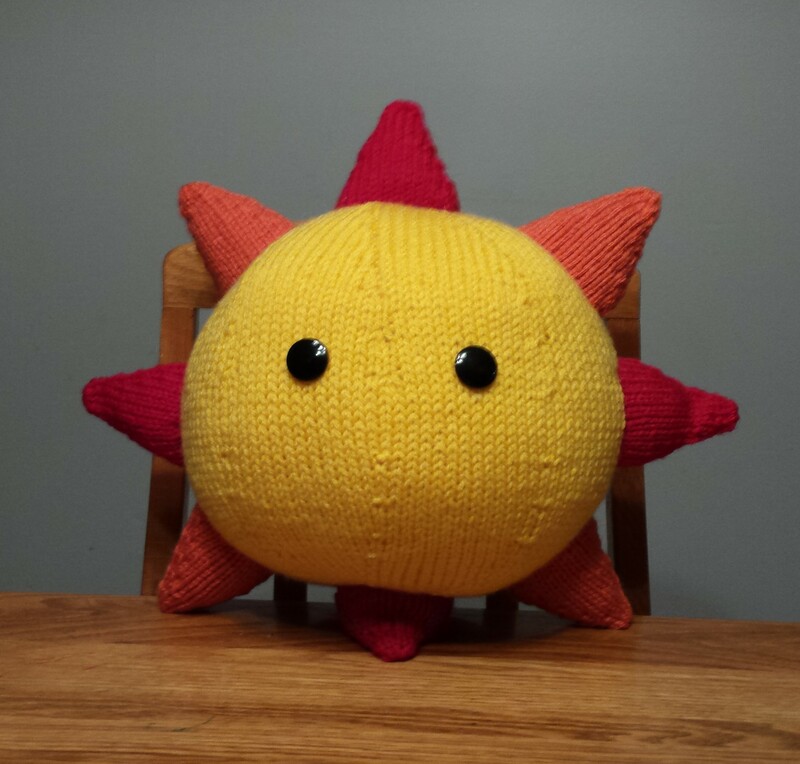 It was fun to make, but I always tend to overstuff crochet plushies. Even though I used a small hook, some of the stuffing is still showing a bit. And for my big kid Jellybean, I made a Red Dragon. 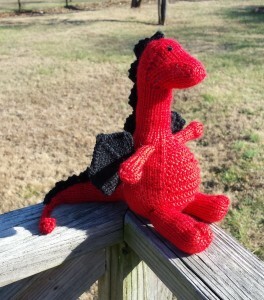 Red is his favorite color and he’s been big into dragons and dinosaurs lately. When he opened the gift, he said, “Mama, did you make this for me?” When I told him I did, he said, “Oh, Thank you mama!” Talk about melting your heart! I make my kids lots of stuff, mostly articles of clothing, and he’s seen what work goes into those things. I feel like he knows and appreciates, at least on some level, the amount of time and effort I put into the things I make for him. I learned a long time ago that when you give a handmade gift, you must give it freely and let go of it when it’s given. Especially with kids, but even with adults, you can’t be guaranteed that they will cherish having it as much as you cherished making it. Seeing that he really loved it made me smile. With that wild imagination of his, Jellybean named his dragon Benm. At least, that’s what his name is right now. There were a few other gifts for Christmas, too. A crocheted doily for my mom, that I didn’t get a picture of (and almost forgotten I had made!) and an afghan that I made for my Mother-in-law. That one has a story behind it that I will have to tell at another time. As far as the rest of the year goes, I did finish Jellybean’s sweater, finally, and I even got the zipper sewed in. It was nerve-wracking putting my hand knit through the sewing machine but it turned out to be quick and easy. He loves it and wears it frequently. I also made Lollypop a sweater and both of them hats. Jellybean is wearing the sweater I made him last year. Try to ignore the furniture in the background. One day, we’ll have coordinating furniture that isn’t cat-clawed. Maybe in about 20 years. 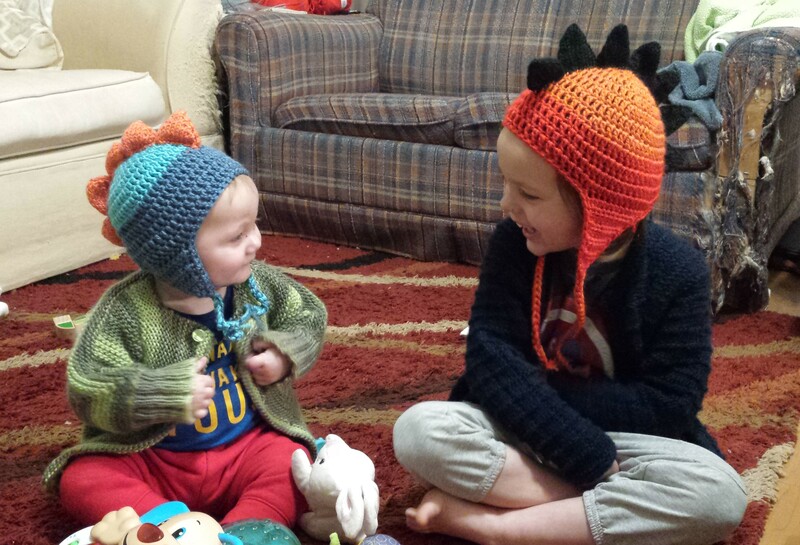 The hats are supposed to be dinosaur hats, but Lollypop’s just looks like a chicken and Jellybean calls his a dragon hat. ¯\_(ツ)_/¯ They’re still cute! I made several other things this year, but mostly for Lollypop and you’ve seen those before. It’s become sort of a tradition to make a large project each year. Last year, I made myself a sweater, which I still wear constantly during the cool months. I also made my husband a sweater. Then I made it again in the right size. I just realized I never posted about the corrected sweater, but I finished it right as the last very cold days were wrapping up in February this year. I think I actually finished it on the last day it would have been comfortable to wear. He has worn it once, and it fits and looks pretty good, although I am going to go back and put elastic in the neck, cuffs and waistband. It’s 100% wool, though, and we live in Tennessee, and he works in a wood shop, so occasions to wear it are infrequent at best. As I write this, there are two more days left in the year. I am 99% finished with a scarf for Jellybean (that he requested – it’s RED, of course!) and I think that may be the last project I will be able to finish. Currently, I only have the scarf, a baby blanket for a dear friend and my epic evenstar shawl on the needles, so I’m cleaning up my knitting nook, organizing my stash, and making a plan for the projects I’ll make next year. Next time I’ll share my ideas and hopes for my knitting in 2017. I hope you and your family have had a wonderful holiday and a very happy new year!